WASHINGTON, D.C.—In honor of Veteran’s Day, 19 new World War II lesson plans are being released on the award-winning, ABMCeducation.org. This free resource for teachers was produced out of a partnership between National History Day®, the American Battle Monuments Commission (ABMC), the National Cemetery Administration, and the Roy Rosenzweig Center for History and New Media. Designed to reinvigorate the study of World War II in American classrooms, the site features lesson plans on a variety of subjects from art to science and everything in between. The new lesson plans were created by 19 exceptional educators chosen to participate in the 2017 Understanding Sacrifice program. Participants chose one American service member from their hometown or state who made the ultimate sacrifice and is buried or memorialized at an American cemetery located near the Pacific Ocean. 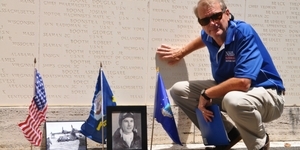 Teachers spent a year uncovering the life story of their fallen heroes. Concurrently, teachers developed in-depth lesson plans utilizing their research that focused on one element of World War II. Because immersive experiences create richer teaching materials, the group then journeyed to San Francisco, Honolulu, and Manila to walk in the footsteps of history to see first-hand the places that influenced the outcome of the war. At each American cemetery, participants delivered powerful graveside eulogies to their fallen heroes. These eulogies are viewable on https://ABMCeducation.org. Using this experience, the teachers designed lesson plans specific to their teaching discipline. These lesson plans are a free resource designed to help American students better understand the sacrifices that American service members made during World War II. Designed for middle and high school classrooms, the lesson plans are multi-disciplinary and can be applied in history, art, math, science and English classrooms. Using primary and secondary sources, videos, and hands-on activities, students are transported from the modern-day home front to the war front of the past. They are asked to debate island hopping strategies considering the geographic challenges posed by the vastness of the Pacific Ocean, explore the experience of prisoners of war, and gain an understanding of the roles of women and minorities. Students will walk away with a vivid understanding of the vast scope of World War II history and the men and women who risked everything. The following educators participated in the 2017 Understanding Sacrifice program. Each lesson plan is based on solid scholarship, integrated with Common Core Standards, and makes use of interpretive materials provided by the ABMC and NCA. They are accompanied by research and eulogies about fallen heroes of World War II who are honored at American cemeteries and memorials in San Francisco, Honolulu, and Manila. National History Day® is a non-profit education organization based out of College Park, MD. Established in 1974, National History Day® seeks to improve the teaching and learning of history through a variety of curricular and extra-curricular programs that engage over half a million secondary students around the world each year. More information is at nhd.org. Established in 1974, VA’s National Cemetery Administration (NCA) operates 135 national cemeteries and 33 soldiers’ lots and monuments sites. More than 4.3 million Americans, including Veterans of every U.S. war and conflict, are buried in VA’s national cemeteries. For Veterans not buried in a VA national cemetery, VA provides headstones, markers, or medallions for placement in private cemeteries around the world. The Roy Rosenzweig Center for History and New Media at George Mason University uses digital media and computer technology to democratize history— incorporating multiple voices, reaching diverse audiences, and encouraging popular participation in presenting and preserving the past. For more information, visit http://rrchnm.org.